My name is Michaela, and I work with Amy Peppercorn Photography as Office Assistant / Marketing Guru. If you see any recent print or online features where Amy’s work was highlighted in a publication, odds are I was the one to get it there! Along with Amy, of course. Because where would we all be without her absolutely jaw-dropping photos? Amiright? I say this as if I know what it means to have the gift of Amy’s photography chronicling my personal love story. Well, readers, I am fortunate to say that I know firsthand! While I am now part of the APP team, I first connected with Amy back in 2015 when my now-husband and I booked her to cover our wedding. After seeing her plethora of wedding albums, along with meeting her in person, we were easily convinced. We felt strongly about her penchant for capturing genuine, heartfelt moments in an artistic and editorial manner, and we never looked back! As a bride with Amy, I always felt extremely at ease, which is saying a lot for how much a typical couple wants to control everything involved with their big day! My husband and I were able to trust Amy 100% with our timeline and vision because she felt like a kindred spirit - one that knew what she was doing, and did her best to capture the details that meant the most to us. She was organized, passionate, and super fun to be around every time we met up, whether for a few hours of engagement photos or in her delivering the printed save-the-dates she co-designed with us. It was clear in every interaction that Amy valued us as clients and we weren’t just another paycheck or another couple. I know now from working with her that she consistently recalls little facts about couples and their wedding days - even the stories of how they met - with ease. She really enjoys getting to know each client, and values the memories of their time together. My time as an APP bride was so relaxed - you can’t help but feel carefree under Amy’s guidance. The most I had to worry about when having my photos taken was trying to look a normal amount of happy! Between marrying my best friend and having one of the best photographers in — I’m gonna say it — the country photograph you, it makes a girl smile REAL big. Luckily Amy is an expert in capturing the most joyous moments, and every photograph she delivered was flawless. If you’re not accustomed to having your picture taken, it can be daunting to work with an accomplished photographer. Just remember, the vast majority of Amy’s couples also had no experience with a photoshoot, and if you see her work, you can see why a lack of modeling has no bearing on whether you get outstanding photos from your session! Your investment with Amy is a guarantee to memories sealed in time. The great thing about shooting with Amy is that she just wants you to be yourself in front of the camera! If you’re feeling silly, she’ll take that energy and maybe direct you and your partner to dance a little, or just face each other holding hands. The rest you don’t even have to worry about (a welcome departure from the rest of wedding planning!). Amy translates small moments into photographic art. 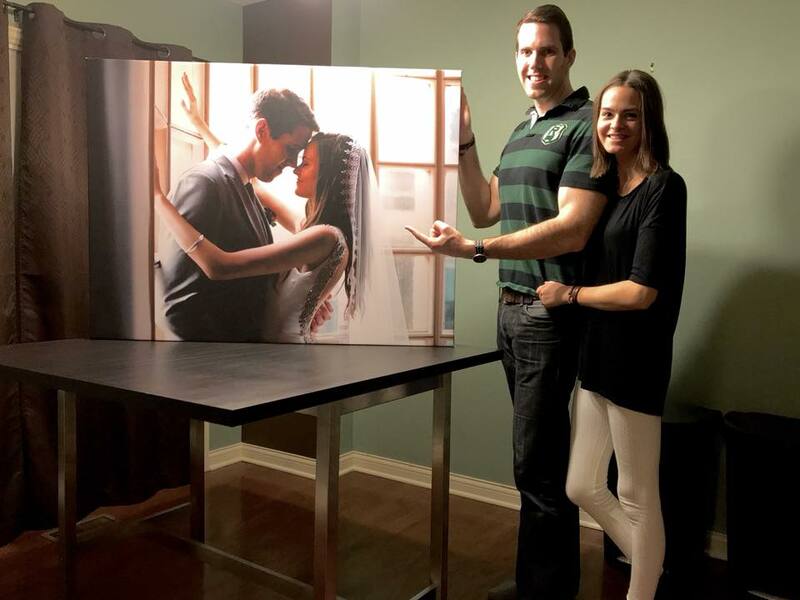 Post-nuptials, my husband and I spent months pondering our wedding album, trying to decide which photo to print on a canvas to join the one we’d printed from our engagement shoot. It wasn’t an easy choice, but we did finally settle on one! The rest of our favorite shots from our big day were assembled into a photobook and a frame of 3 smaller prints. As you can see, we are unabashedly happy about our choice to work with Amy. Our photos are a constant reminder of one of our favorite days! My experience as an Amy Peppercorn Bride couldn’t have been any better. Thankfully, when I made a career shift from working in fashion to working in the wedding industry, Amy simultaneously found herself needing a little extra help, and the rest fell neatly into place! I know all my fellow APP couples out there feel just as fortunate as I do - and I’d love to hear your stories in the comments below! How did you find Amy’s work? How you do think choosing Amy contributed to your day? Have an amazing day! And don’t forget to check back weekly for more blog posts!